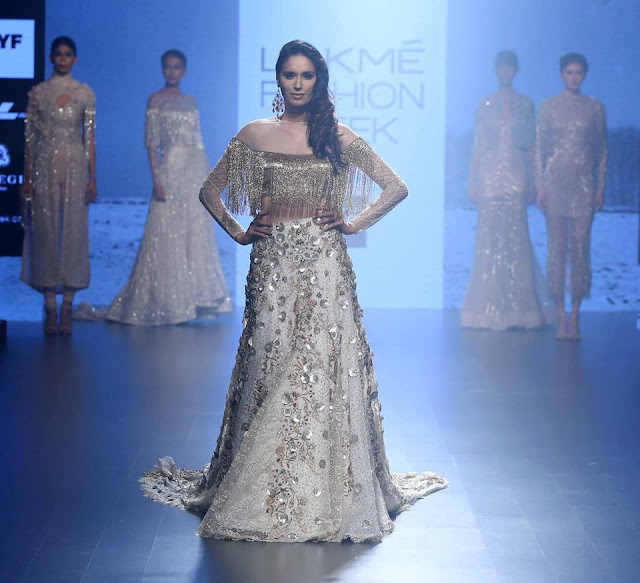 I have been covering my favourite shows from lakme fashion week Summer/Resort 2016 . My favourite collections are mainly ethnic wear, I just love indian traditional wear, the cuts, the flares and the modernized avatars these Fashion weeks unleash. After browsing for more than 2 dozen designer collections from Lakme fashion week I put together this heavily trimmed down list of fresh off runway outfits which include sarees, lehengas, gowns and anarkalis. Feast your eyes, get inspired and build your trousseau with the latest trends. 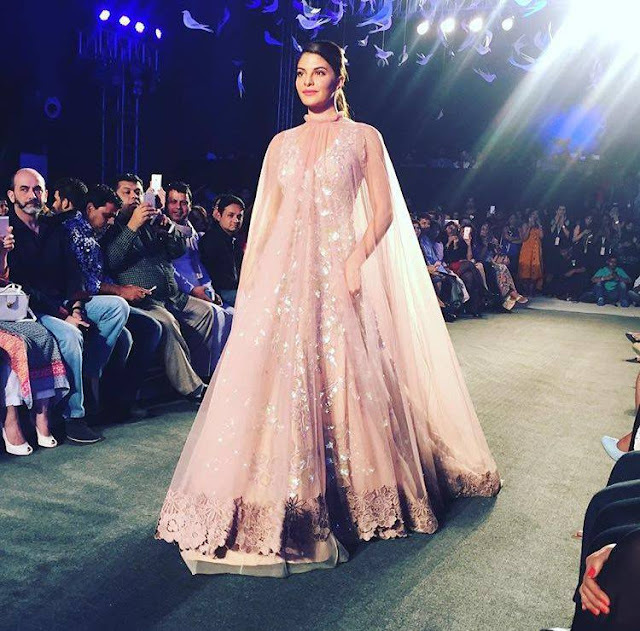 Dreamy, pastel, romantic, trail, cape, sheer and shimmer . What is not to love? 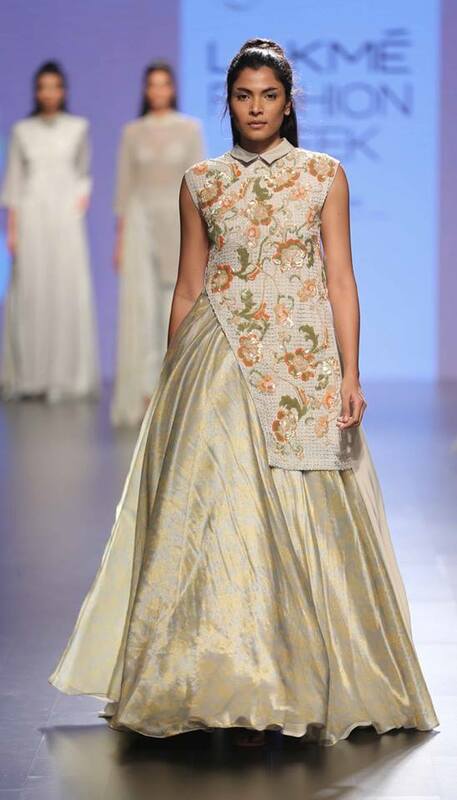 Garo by Priyangsu and Sweta Tantia presented a high on colour collection which has asymmetrical details in abundance. There is a lot going on with this outfit, the one sleeves, a belt of sorts, printed underskirt, lace and more but it all gets balanced out because of the light colours on play. A bride who wants something different for her sangeet, try this. Another one by Garo, this silhouette is super modern take on indian wear. 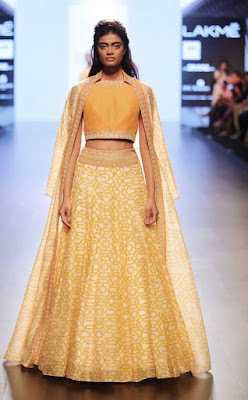 The pant lehenga type of combo with zipped top. Good option for mehendi or sangeet . 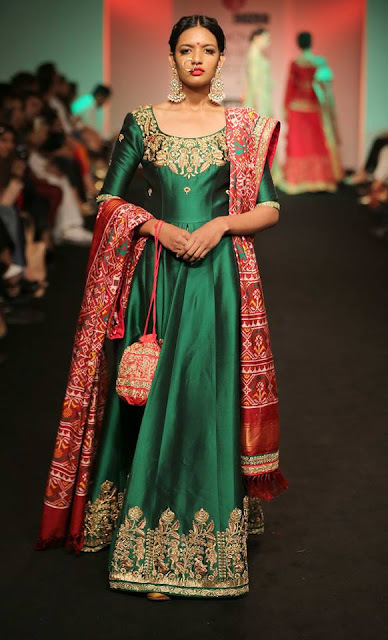 This emerald green floor length anarkali has a rich look and the addition of red dupatta adds to the regal feel. 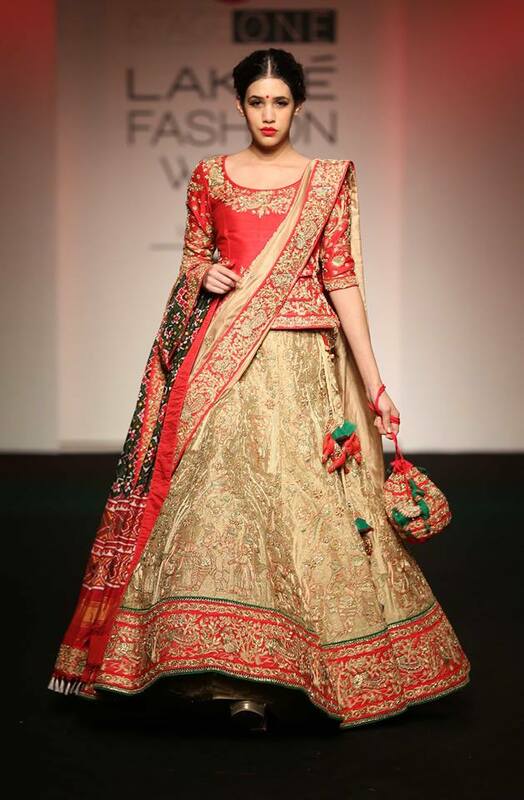 Beige is a good pick for brides and this outfit has red peeking out lehenga which adds right amount of bright needed. Special love for pockets on the blouse. 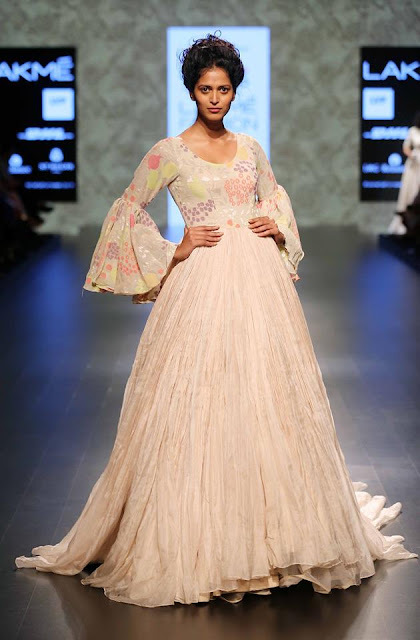 This is another Lehenga i loved from Saroj Jalans collection. 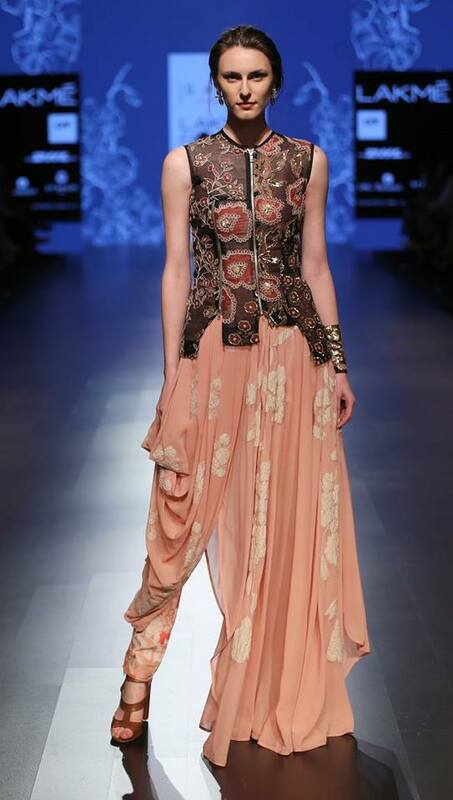 The colour combination works well and the double dupatta drape is also cool. Anita dongres collection was all about breezy printed silks. 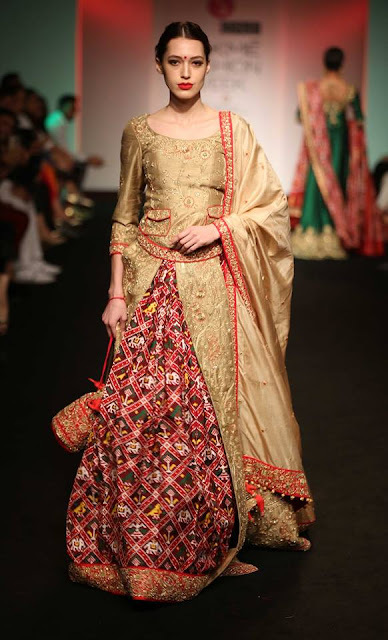 There were lehengas and slit kurtas which will be ideal for sangeet of the sister of bride. 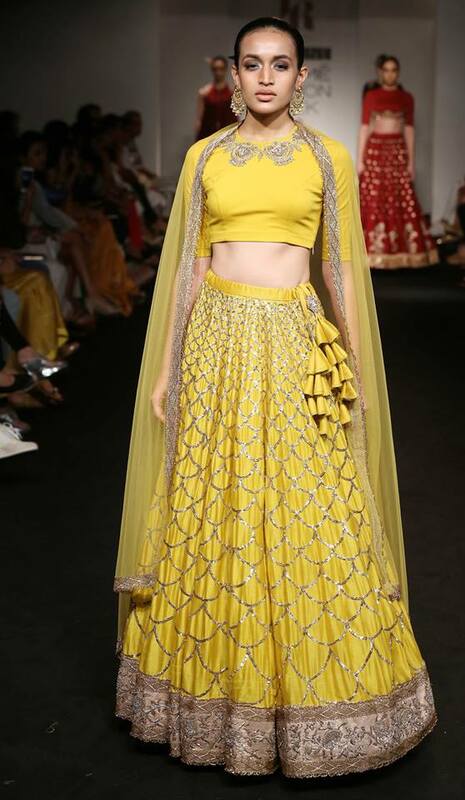 This particular lehenga will be perfect for sangeet especially the unpinned dupatta drape which is easy to dance around in, or just throw away when you are in mood to dance. Actress Shurti Hasan turned show stopper for Anushree Reddy and walked ramp in an ivori chanderi Lehenga which featured a lily print dupatta. I love how this outfit is feminine and has a hint of florals. The scalloped edges on the lehenga is another thing i loved but the colour, too dull for a bride. If you want to wear this to your engagement add some colour via jewellery of a pop of bright lips. SVA impressed me this time around , i loved how they paired jacket over blouse. This summery yellow with floor length jacket is just amazing. Reception, wedding or even mehendi or haldi , Go try this . This green version with shorter embellished jacket is another beauty. Love it. 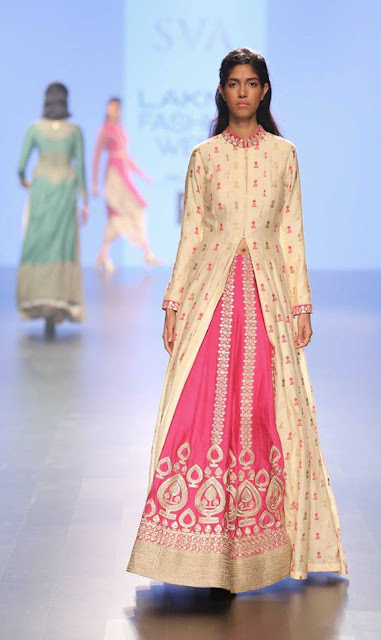 This cream and pink front slit kurta with lehenga is another nice option for brides for their sangeet. This Jayanti Reddy yellow splash is nothing different or amazing but the simplicity of it is enough to fetch a mention here. Special for the latkans. 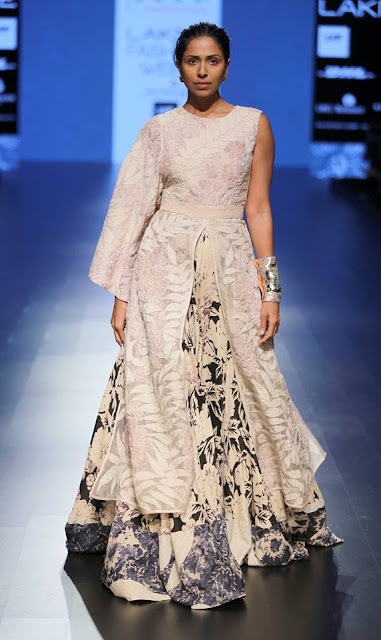 Gaurang usually does silk sarees and so i was very surprised to see this disney kind of gown . Love the sleeves and subtle colour on top half which balances the heavily flared bottom. 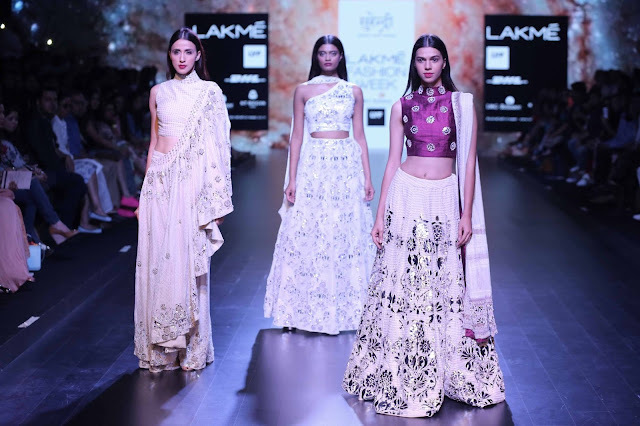 Surendri presented a wide variety of tops paired with lehengas , I like all these three outfits. Did you like anything from my favourites?